The Basilica di Santa Croce is one of the finest examples of Baroque architecture in Salento. The façade has incredibly detailed stone decorations that are thought to be connected to the celebration of the victory in Lepanto (1571). The interior, on the Latin cross plan, has beautiful paintings and the magnificent altar of San Francesco di Paola. 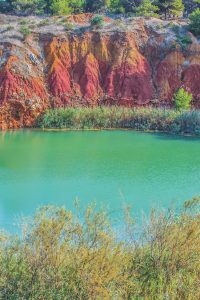 Located near Otranto, not far from the Punta Palascia lighthouse, is this disused bauxite quarry discovered in the 1940s and active until 1976. Although it is not particularly easy to reach without a car, this is a natural wonder definitely worth a visit; the emerald green of the water and of the intense vegetation contrasting with the deep red soil is an incredible sight. Choose one of the many organised boat tours in Porto Cesareo. You will be able to visit some of the most beautiful coves, beaches and islands of the Ionian coast, such as Porto Selvaggio, Santa Caterina and Punta Prosciutto. If you fancy it you could even snorkel in an underwater archaeological site. Along the route, stop at one of the many beaches to sunbathe and enjoy the wonderful landscape. The coastline of Punta Pizzo, just south of Baia Verde, is one of our favourite spots in Puglia, offering a peaceful beach surrounded by nature. The beaches along this stretch of coast are just incredible. Our favourite spot, Tabù, only 5km from the centre of Porto Cesareo, is a fantastic sandy beach with dunes and clear blue water. Le friselle (or frise): Typical produce of Salento, friselle are twice-baked ring-shaped hardened breads that are soaked in cold water for less than a minute, then pressed slightly and drizzled with extra-virgin olive oil and topped with diced tomatoes, salt, pepper and oregano. They are usually made with wholegrain barley and durum flour. Legend has it that the Trojan hero Aeneas brought them over to Italy. Pasticciotti: …con crema, pistacchio, marmellata di ciliegie o mandorle – local pastries filled with cream, pistachios, black cherry jam or almond. The best we had were from Vecchio Ingrosso, a small bar/bakery in Gallipoli, located on the Riviera Cristoforo Colombo. La Tarantella: In the piazze of Apulia there are often opportunities to enjoy a performance of tarantella, particularly in summer. The tarantella is a couples’ folk dance characterised by quick steps and flirtatious movements, usually accompanied by tambourines. Its origin is connected with tarantism, a form of hysteria associated with the bite of the tarantula spider – the frenzied dancing is supposed to have curative effects for bite victims. 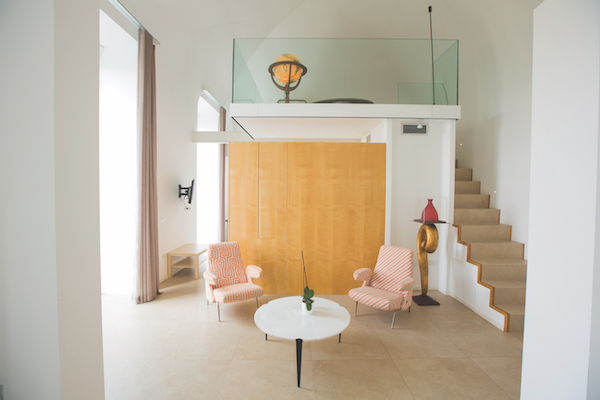 Located in the heart of Lecce, this B&B (above) has an elegant interior and luxurious suites. Breakfast is fantastic: homemade cakes and pasticciotti. We were so lucky to stay in the junior suite Sarah, a spacious room with a living area and mezzanine. Excellent B&B run by a friendly family right in the centre of Porto Cesareo, with fantastic views over the harbour. Two big terraces, a very nice restaurant and clean, modern bedrooms will make your stay here very enjoyable. This historic house in the heart of the old town centre dates back to the 18th century. It has elegant interiors and beautiful terraces with citrus trees and prickly pears where you can enjoy a breakfast buffet or a drink. Four-star hotel on a hill 1km from the centre of Otranto and 8km from Porto Badisco. Superb views over Otranto, elegant rooms with modern comforts, a roof garden with solarium and jacuzzi, and a wellness centre. If you can drive and do not mind not being in the centre of town, this is the ideal setting for a relaxing luxury holiday. Immersed in the countryside between Otranto and Giurdignano, the Tenuta has a beach club with VIP loungers and straw umbrellas where you can enjoy relaxing days in perfect privacy. This unpretentious osteria in the heart of Lecce offers lovely simple dishes and is full of locals. It is always incredibly busy so you must book in advance. 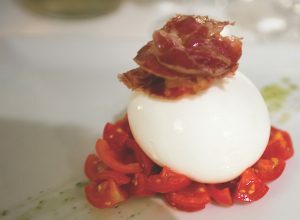 This elegant restaurant in the heart of Lecce near the Basilica di Santa Croce offers exquisite dishes. I recommend the tartara di tonno con mousse di sedano (tuna tartare with celery mousse) and the pannacotta con zafferano (pannacotta with saffron). 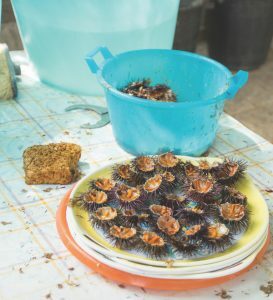 Located near the castle, this restaurant managed by friendly Giuseppe, Oronzo, Davide and Alberto offers a great selection of fresh fish from Salento and excellent local wines for you to enjoy after your sightseeing exploits. 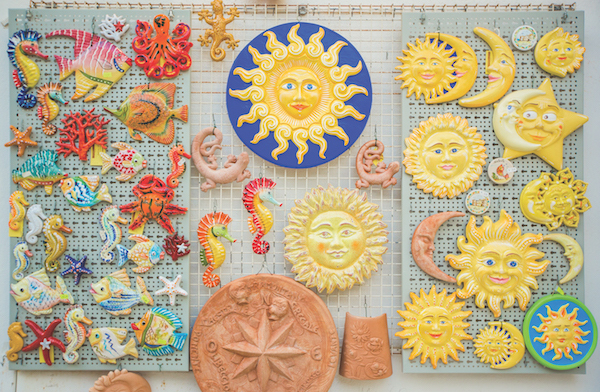 This small, family-run friggitoria located in the main square near the stunning beach. It offers delicious dishes created with fresh local produce (all the fish is bought daily from the nearby fishmonger). Brindisi airport has seasonal flights to Heathrow (BA) and Gatwick (easyJet), and year-round connections with Stansted and Manchester (Ryanair). There is a railway mainline that runs from Milan to Bologna to Rimini, and then all the way down Italy’s Adriatic coast as far as Lecce. Driving all the way to Salento would be an adventure in itself, but hiring a car while you are there is advised. 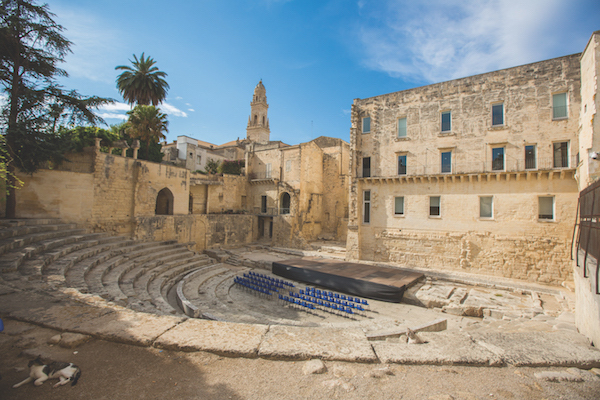 Find out about Sara’s Salento travels and get inspiration for your own trip here.